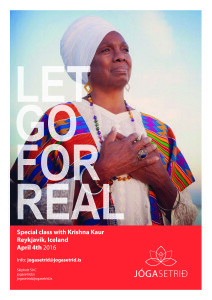 Krishna will be in Europe this Spring, join her as she teaches a signature class– The “Let Go For Real” workshop! The art of “letting go” is the basis of successful living. Lettinggo of past mistakes, past relationships and old feelings of regret that haunt the mind of the most beautiful person. LETGO FOR REAL is a recipe for success in all walks of life. It gives you space, mentally physically and emotionally to enjoy the awesome person you really are. And …….. you’ll have fun doing it!